So, I was right about some things and wrong about others. You cant win them all. Though I did get one strong endorsement from Tweeter @ClevTA who claims that my classification tree helped him win his pool, besting about 350 other entries. Let’s look at what the classification tree predicts this year. The first split is based on RPI of 0.6169. Teams above this threshold will be the R groups (right hand side of the tree image below) and teams below the threshold with be the L groups. 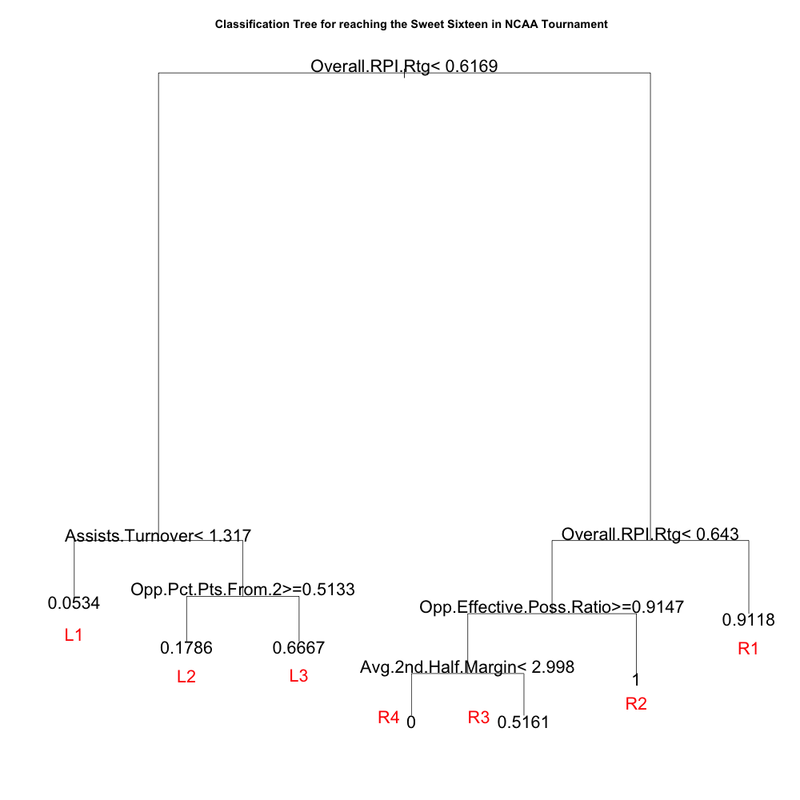 Overall, in the years used to build the model, teams in the R group advanced to the Sweet Sixteen about 67 percent of the time, whereas teams in the L group advanced just less than 10 percent of the time. The R group teams this year are Duke, New Mexico, Louisville, Miami (FL), Kansas, Gonzaga, Florida, Indiana, Michigan State, Georgetown, Ohio State, Marquette, Memphis, Syracuse, Arizona, North Carolina, Michigan, Kansas State, Belmont, Saint Louis. All the other teams are in the L group. Of course all four of these teams can’t make it to the Sweet Sixteen as Arizona plays Belmont in the Second (nee First) round of the tournament. Butler and VCU have both advanced to the Sweet Sixteen out of this group before. L1 (6/45): Wisconsin, Cincinnati, Louisville, Xavier, Ohio, North Carolina State, The remaining 39 teams.